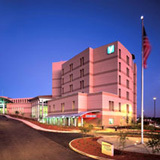 Yuma Regional Medical Center, located in sunny southwestern Arizona, is a 369-bed acute care hospital and the sole provider serving the city of Yuma and the surrounding region. YRMC offers high quality care and advanced technology within a compassionate and caring environment. Our medical staff is currently comprised of more than 300 physicians in over 40 specialties. Mayo Clinic officials announced Yuma Regional Medical Center (YRMC) as a member of the Mayo Clinic Care Network. The collaboration between YRMC and Mayo Clinic physicians will be rolled out initially through Yuma Regional Cancer Center, with opportunities for our physicians to work together in additional specialties in the future.